Learn why IT experts use User Device Tracker to help locate users and track devices on the network. Locate connected devices with ease by searching IP or MAC address, user, host, node, port, or vendor. Network device identifier is designed to help monitor wireless access points, switches, and ports for errors, performance, and capacity usage. Trace unauthorized users and rogue devices on the LAN or wireless network with watch lists. Remotely turn switch ports on and off to improve security, or resolve issues such as IP Conflicts. Immediately locate network devices on your LAN and wireless network, and retrieve switch name, port, port description, VLAN, VRF data, vendor information, all from a single console. Gain knowledge of port status and usage, response time, packet loss, CPU load, memory utilization and more. Network device tracker can identify switches operating at near capacity and where you can reclaim unused ports. With out-of-the-box reports, you'll also receive current utilization metrics to help forecast capacity requirements. Trace unauthorized users and rogue devices on the LAN or wireless network. Receive alerts when suspicious devices connect to your network.Create a device watch list for tracking monitoring devices by MAC address, IP address, or host name for both your wired and network devices. Remotely shutdown a compromised network device port with point-and-click simplicity. Detect rogue devices and shutdown the port to mitigate security risks or prevent network problems. 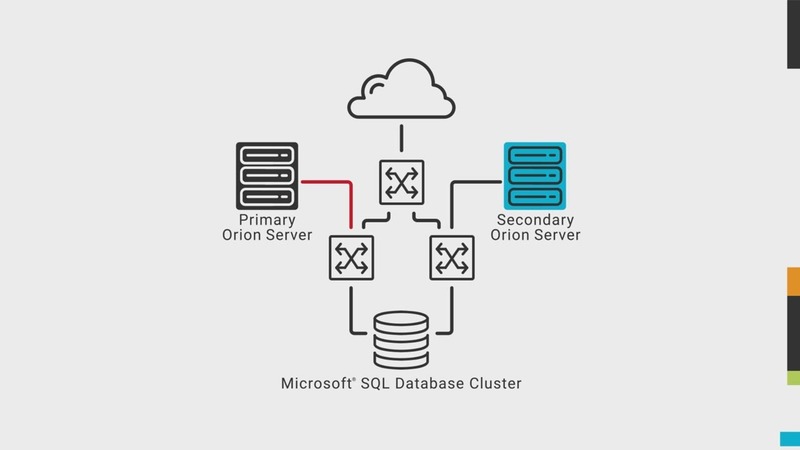 UDT is part of the Orion® platform enabling a unified IT administration dashboard. 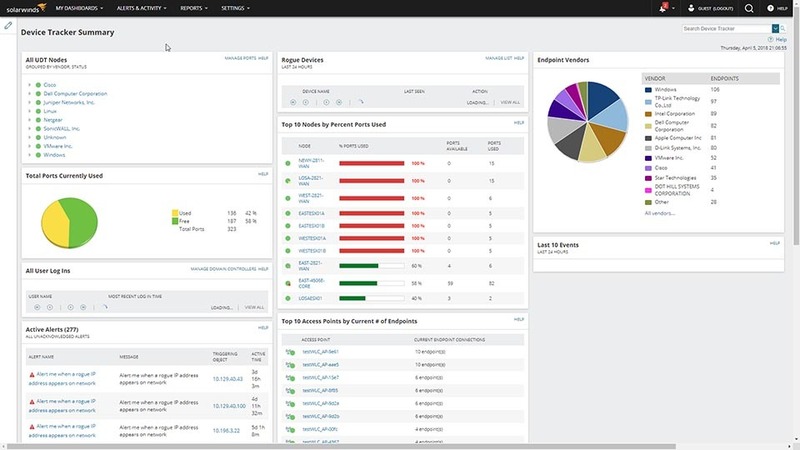 The UDT dashboard integrates with other SolarWinds management products including Network Performance Monitor, IP Address Manager, Network Configuration Manager, and more. Investigate incidents using extensive device connection and user logon data. Use “History Connections” and “All User Logins” to unveil the date and time users entered a network, through which specific node port, SSD, or access point, via what connection type. Acquire user details via Active Directory®, including user name and contact information. Gather user details and reveal all endpoint logins, specifically endpoint name and most recent login time. UDT comes with multi-vendor device support. Take advantage of multi-vendor device support that’s compatible with many SNMP-managed switches and access points. UDT device tracking software is built to provide port description, VLAN assignment, connected MACs, and port configuration information. View summary of end points by vendor. Use the Endpoint Vendor pie chart with the numerical data key in the UDT network device identifier tool to help understand what vendor equipment is connected to your network. Improved network reliability and control with the combination of UDT and Solarwinds IP Address Manager. 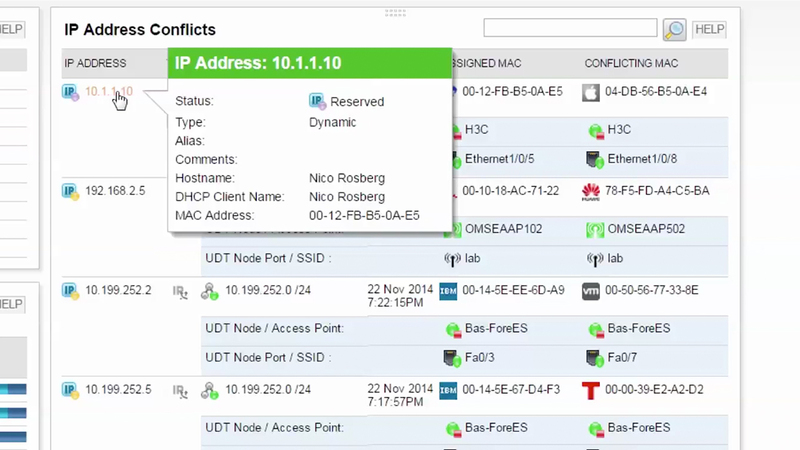 The IP Control Bundle alerts you to IP conflicts and helps you locate and isolate the conflicting device in seconds. Enhance User Device Tracker with NetFlow Traffic Analyzer. Identify and shut down specific high-bandwidth devices (or endpoints) by combining the functionality of User Device Tracker with Netflow Traffic Analyzer. Be up and running in an hour. Install, configure, and begin using User Device Tracker in about an hour. Features Overview Learn why IT experts use User Device Tracker to help locate users and track devices on the network. User Device Tracker is an industry favorite. Hands down. “We utilize UDT to help us trace down service accounts that have been used, old legacy historical accounts." "We've definitely saved money by using UDT to discover where an endpoint is connected and saving the time of chasing down the MAC across the campus." "Since rolling out UDT it has been great. I can go to one central location to find the devices and what switch they are connected too. Others that do not have access to the switches, are able to view the switches online to see if the computers they work on are connected or not." "Repeat offenders, rogue devices, lost/stolen devices all became quickly and easily trackable by anyone in IT, not just the networking team." Where can I find information on installation and customization for my UDT product? Our UDT Documentation section was created using customer feedback and contains guides and articles that will help you be more successful with your installation and customization. 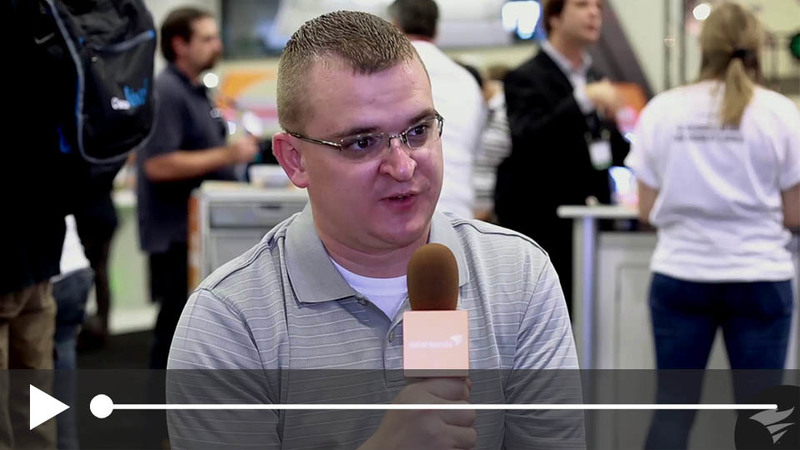 SolarWinds offers an onboarding assistance program called Smart Start if you are looking for help getting UDT set up and optimized. We will provide you with access to one of our implementation experts who will work with you to understand your goals, assist you in installing and configuring your product, and help you optimize your environment for how you need your business to run. What is device tracking software? Device tracker software identifies where endpoints are connected, and offers the ability to search, based on user names, host names, and IP or MAC addresses. Automatically discover, map, and monitor switches, ports, and network devices with User Device Tracker. UDT quickly finds devices and retrieves user name, port details, connection history, and more. The network device identifier tool can also provide detailed switch port usage data, capacity analysis, and includes built-in reporting. For capacity analysis, SolarWinds UDT can tell you the number of switches currently in use on your network in a time frame and which switches are operating at or near capacity. This information gives you a clearer view of how the ports on your switches are actually used and where you can potentially reclaim unused ports. You can also use UDT network device tracker to deliver detailed reports on switch load to justify purchasing new equipment. Our network device tracker provides you with the ability to locate a switch and port where a particular hostname, IP, or MAC address is currently connected or was connected in the past. SolarWinds User Device Tracker helps you watch devices and ports on your network to evaluate port usage, capacity, and to find available network ports. With SolarWinds UDT, you can find the exact location of devices in your network as well as detailed load analysis data. The device tracking software periodically polls switches and routers for data about what is connected to them, saving both current and historical data about when and where a device has been connected in your network. React quickly to security threats and events with User Device Tracker. The network device locator can send an alarm each time a particular IP or MAC address connects to your network. UDT also allows you to whitelist and add devices to watch lists with automatic alerts and click-of-a-button port shutdown. When you add a computer to the watch list, the network device identifier can then see when and where that computer connects to your network, whether a device has been on the network in the past, and can pinpoint the last known location of an unconnected device.